Provide comfort for the family of Cynthia Barber with a meaningful gesture of sympathy. 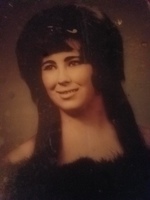 Ratliff City - Mrs. Cynthia Joan (Vaught) Barber, 70 of Ratliff City departed from this life on March 23, 2019 in Ardmore. She was born on November 22, 1948 to the late Mr. Glenn Vaught and Mrs. Laverne (Flowers) Vaught. No services are scheduled. Services are under the care and direction of Alexander Gray Crematory in Ringling. Cynthia enjoyed working in the yard and her flower beds, and watching the birds. She loved spending time with her family which were her world. She loved being at home where she was a devoted homemaker. Preceding her in death are her parents; son, Larry Todd Barber in 1997 and brother, Robert Vaught. Cynthia is survived by her husband, Larry of the home; daughter, Mandi Tidwell of Healdton; grandchildren, Koby Tidwell of Ratliff City and Destinee Wofford of Velma; sisters, Celia Vaught and Lavonna Vaught both of Conroe; and a host of other family and friends. To send flowers in memory of Cynthia Joan Barber (Vaught), please visit our Heartfelt Sympathies Store. Provide comfort for the family of Cynthia Joan Barber (Vaught) by sending flowers. May the family of Cynthia Joan Barber please accept my sincere condolences hoping you find comfort in God's words at Acts 24 : 15 and Psalm 37 : 29.